Relatives on Baltimore Parade, Merriwa, grieve for William Maker, who was hit by a car. 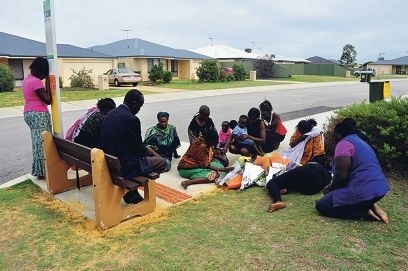 A group of William Maker’s grieving relatives gathered on Baltimore Parade, Merriwa, on Tuesday, visiting the site of the incident that resulted in his death. Placing flowers around a handmade cross near the bus stop, his mother, sisters, aunts, uncle and others sat to sing and pray for the 29-year-old who died after an alleged hit and run last Saturday. His sister, Mary Maker, said her brother left the family home in Butler about 8am that day, planning to go to a McDonald’s store, and then he and a friend walked to Baltimore Parade. Less than two hours later, she was told over the phone that he had been hit by a car and rushed to the scene. Mary ran for help from relatives, who live metres away from the bus stop, and went to hospital with her brother, who had sustained head injuries and later died. Survived by his mother, two sisters, a brother and step-brother in Perth, as well as his wife and his father in Kenya, Mary said her brother had touched lives from Sudan to North America. ‘William was a peaceful guy, a pure-hearted person, a man of the people,’ she said. ‘The whole community is shocked and crying ” he was so caring, so loving and supportive, and a hard worker. Mary said her brother had struggled after his first marriage fell apart and in November 2010, he went back to Sudan to stay with their father. There he met Ajok Makur and they had a traditional marriage last year, then he returned to Perth in January and planned to get his wife a visa for Australia. Two weeks before his death, he started a new job in Mandurah. ‘I wanted a good life for him, I wanted to see his children, I wanted to see his wife,’ Mary said. A 23-year-old Quinns Rocks man charged with manslaughter over the incident will appear in Stirling Gardens Magistrates Court on May 1.